I have processed a NEF file in Capture One Pro10 and using the 'edit with' option, uncompressed TIFF 16bit, ICC Profile of ProPhoto, @ 300 px/in and then send the file to Affinity Photo. The colour profile in Affinity Photo is set to ProPhoto.When the file opens in Affinity Photo, it has, what I can best describe as a 'lilac' haze, thus looking completely different to the file that sits in Capture One Pro10. Is anyone else experiencing this, and if so, what am I doing wrong. Do you have a similar effect if the image is opened directly in Affinity Photo rather than going through capture one, either the original NEF file or the processed TIF that has been exported? Ive tried this with a NEF from a Nikon D750 and it seems to import fine. I process the file in Capture One, then 'edit with' as described above. If I used the 'open with' Affinity from Capture One, the file goes directly to the 'develop persona' as would be the 'norm' with a NEF File, and has no adjustments. The purpose of my workflow is to enable me to process the NEF File as I would like in Capture One and then finish with Affinity photo then export as usual. 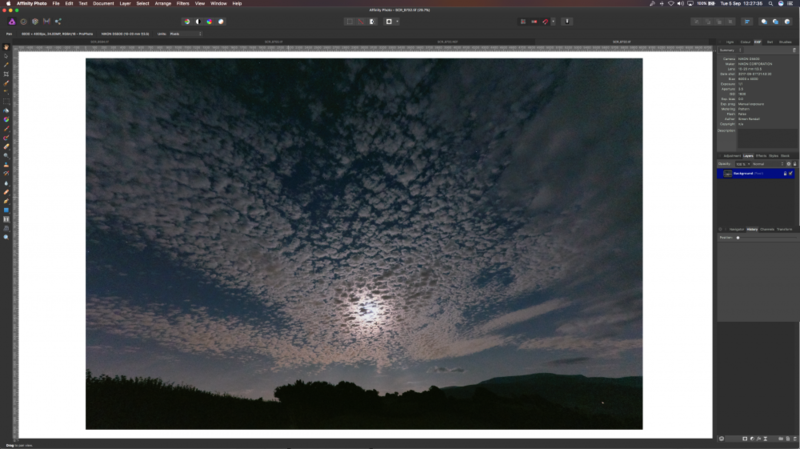 The File Below is the file from Affinity Photo, using the 'Edit with' from Capture One. I hope that the Screenshots are legible and you can see the differences between both. Look forward to hearing from the soon. What version of AP are you using? there have been a few topics where that discolouration appears. Not sure if the latest .81 has the issue I believe it was reported in .80 though. Thanks for the reply, forgive me if I am being a little 'naive' here, the file is an original NEF file, how would I determine if the file is sRGB? I have set the proofing in CO1 to ProPhoto, so when I use the 'edit with' that is using the ProPhoto colour space as described in my original post, the colour space in AP is ProPhoto, so how could it be returning the file to CO1 in sRGB? The colour shift is what looks like a magenta, would this be anything to do with the CMYK profile? As a matter of interest, what is the 'default' CMYK profile recommended by AP, my default setting is attached for info. I think you might be getting a little confused with colour profiles there. to probably add a little more confusion, I tried to replicate this issue here. I followed all the steps, Simon R is describing and set both applications to the same (his) preferences. Used a Nikon NEF shot in AdobeRGB colour space. 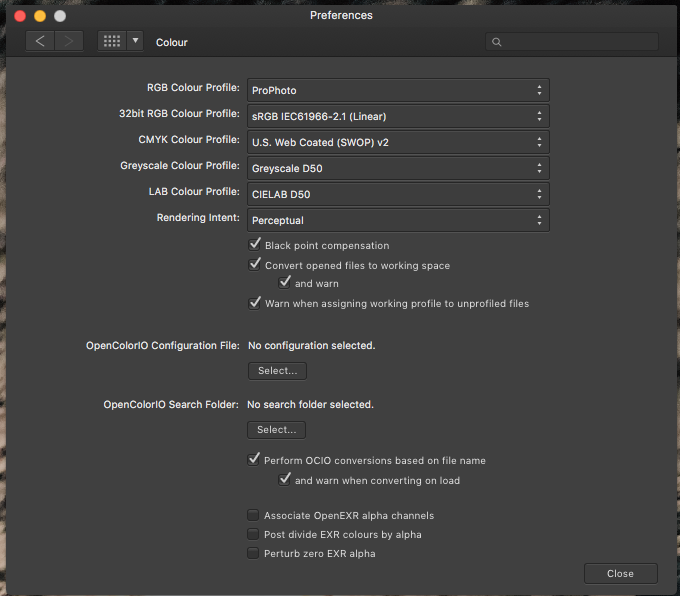 As a result, I can not replicate this issue: Affinity Photo does come up with the same colors as seen in Capture One 10. This is on OSX 10.11.6, COP 10.1.2.26 (5ee1101), AP 1.5.2, hardware calibrated monitor (Eizo). The RGB Colour Profile set in AP Preferences does not seem to influence the appearance of the image, as the file is tagged in COP with ProPhoto.icc. This profile is then read by AP. (AP automatically assigns the RGB-profile from the AP-Prefs to untagged files, what can be an issue, but not in this situation here, with an embedded profile). Also, when COP is set to the default state for Proof („chosen processing preset” [sorry, German COP here], everything works as it should. Sending a file with different profiles (AdobeRGB, sRGB) also results in the same colours and pipette readings. Btw, sending to Photoshop also works as it should. One thing to note: the tif (variant) in COP read slightliy lighter then the NEF, but comparing the NEF in COP with AP or PS, both show effectively equal values. It might be worth checking the monitor profile set in OSX Prefs and the build nr. of Capture One Pro (probably missed an update?). Sorry for this being no solution to the problem, but at least it might indicate, that the cause of your issue might come from somewhere in your setup. Many thanks for this insight. When you mean 'default state' which profile are you using? I have now set mine to Generic RGB Profile. I have also attached another Original NEF and the TIFF variant, the Landscape Photos are workable, with no final adjustments. These were done pre- Generic RGB Profile Change. I also raised a support request with Phase One info below...their final answer is in bold. Thanks. This is likely due to how color noise is rendered in Fit To View mode. Color should always be judged at 100% zoom, just for certainty's sake. 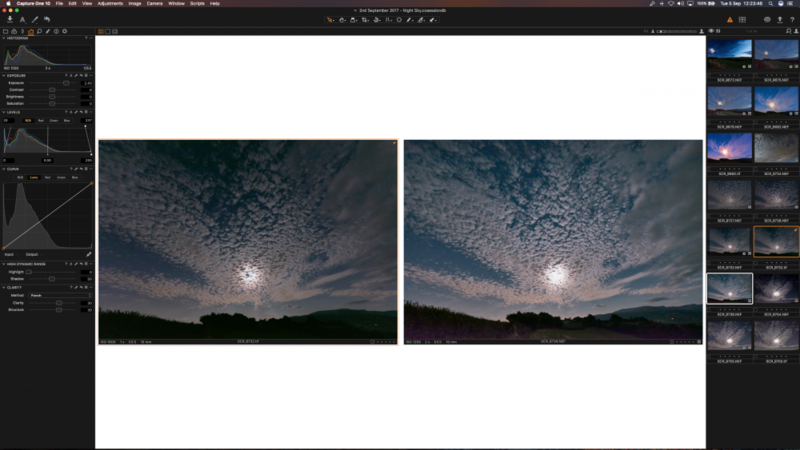 If you view the two images at 100% zoom in Capture One, does the color shift appear? In Capture One, what is your proof profile set to under View > Proof Profile? I have processed a NEF file in Capture One Pro10, using the 'edit with' option, uncompressed TIFF 16bit, ICC Profile of ProPhoto, @ 300 px/in and edit variant to send to Affinity Photo. The colour profile in Affinity Photo is set to ProPhoto. When the file opens in Affinity Photo, it has a Magenta Colour Shift effecting the whole document, no adjustment are made in Affinity Photo. When the 'new' variant opens back in Capture One, the side by side comparison is distinctly different. Could you let me know what the potential causes are for this and any recommended default settings for Capture One to enable the variant to mirror image the original NEF file. just meant that COP is by default set to use the Profile chosen in the actual Processing Recipe. I'm also using ProPhoto as editing working space, but have my Processing Recipes usually set to export with AdobeRGB (some even to sRGB). ProPhoto has theoretical advantages, but practically there is simply no monitor or camera system capable to use this colour space. Did I understand your PhaseOne support ticket correctly in that your issue is resolved by simply zooming in to 100%? Then, I was obviously just lucky by having a larger screen. Thank you for posting the solution, useful information! We have been unable to reproduce this issue, so we have closed it. If further information becomes available, we will reopen the issue.